The Drexel University softball team had a busy week as they approach the close of their 2017 season. The Dragons played four different schools, a total of eight games, and went 4-4 during this span. Drexel split games against Lafayette College in a doubleheader where the Dragons won the first and lost the second April 27. The Dragons won the first game in extra innings, 4-3. Freshman Linda Rush opened up the scoring by tying the Drexel record for doubles with one in the second inning. After, senior Baeley Reed got a bunt down and freshman Hannah Walker hit a single to bring in the second run. Lafayette followed up Drexel’s strong second inning by getting in three runs of their own in the bottom of the second. Linda Rush was able to tie up the game in the sixth with her 11th home run of the year. The game went into an extra inning and the Dragons got a scoring opportunity when freshman Jenelle Ladrido hit a leadoff single and then stole second base. Freshman Taylor Kent grounded out, but Ladrido was able to advance to third. Senior Savanna Johnson then reached base on a fielder’s choice that allowed Jenelle Ladrido to come home for the winning run. In the second game, Lafayette came out swinging in the first and brought home six runs, including a grand slam. After that, Lafayette could only muster up one run in the sixth, but the strong first inning was able to carry them to a 7-4 victory. Rush got an RBI single in the third and both sophomore Taylor Lee and freshman Mari Gardner contributed RBI singles in the sixth (Lee had two), but it wasn’t enough. The Dragons played Colonial Athletic Association rival James Madison University in a doubleheader April 29, and then again in a single game April 30. JMU swept the Dragons in the series. In all three games, Drexel was shut out, and in two of the games Drexel lost by mercy rule. The Dukes outhit the Dragons 26-9 collectively in the three games. Drexel bounced back from a disappointing visit to James Madison with two wins in their doubleheader against Maryland Eastern Shore University. 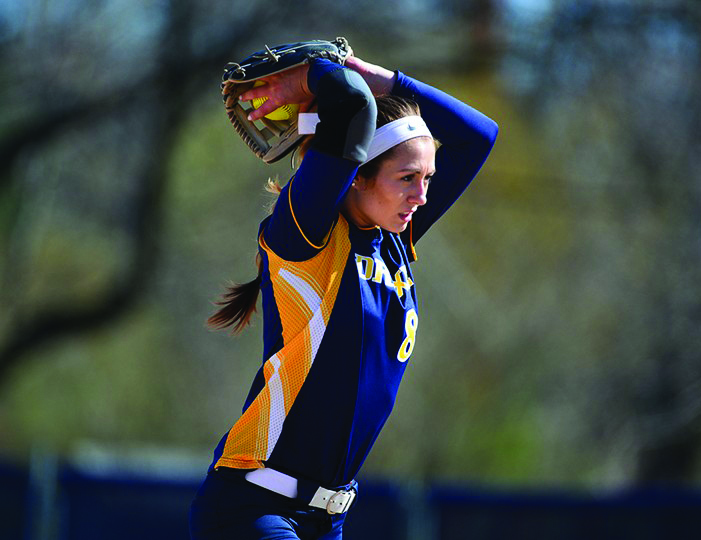 Drexel won the first game 5-3, which gave senior pitcher Tara Konopka her ninth win of the season. Linda Rush hit a homer in the first and Jenelle Ladrido was able to score off a triple because of an error. Maryland Eastern Shore led a strong comeback in the fifth with three runs, but Drexel matched them in the bottom of the fifth with three their own. In the second game, Drexel won by mercy rule in the fifth with a score of 9-1. Drexel scored in all five innings as senior Jourdan Skirha filled the box score, going 2-3 hitting with an RBI and two runs scored. Taylor Kent pitched in as well, going 2-3 and scoring two runs. In the last game this week, the Dragons beat Philadelphia rival Saint Joseph’s University in a shutout. Drexel scored in the second inning off of an RBI by Taylor Kent on a throwing error by the pitcher, so Hannah Walker scored an unearned run. In the seventh inning, Baeley Reed drove in Taylor Kent off of a groundout RBI, giving the Dragons their second and final run of the game. The Drexel softball team improved to 18-28 this week overall and are on a three game winning streak headed into their final games before the CAA tournament. They finish out the season at home against CAA opponent Hofstra University, with a doubleheader May 6 and a single game May 7.